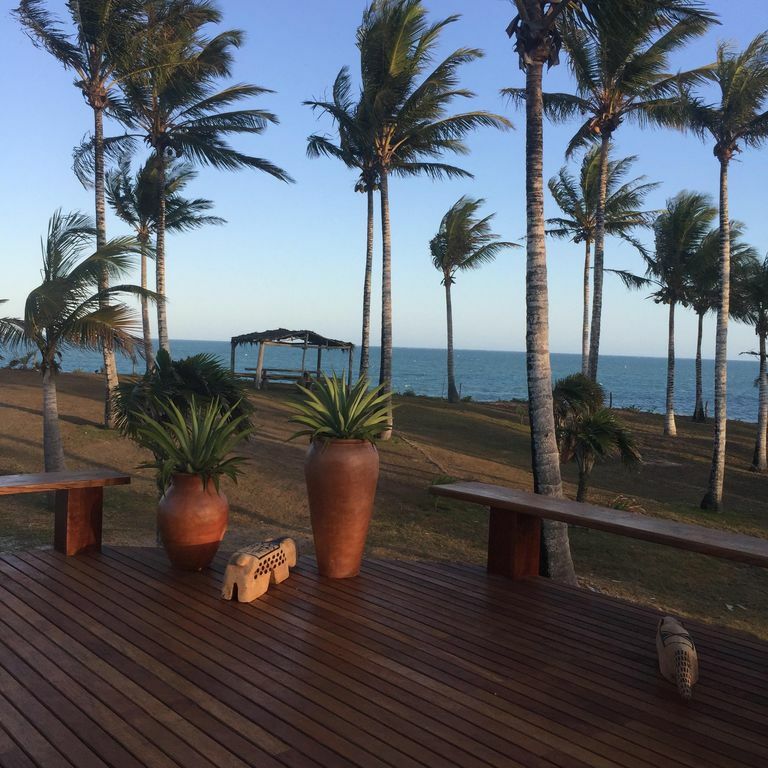 With 130 meters of sea front and stunning landscape, the villa is located in the most reserved and preserved part of Corumbau, in an area of ​​32. 000 m2, covered by coconut trees and with beach at the door. There are 5 large chalets for couples, all with deck and facing the sea, with air, ceiling fan and bathroom with external garden. Each chalet has a total area of ​​85 m2. In case of children it is possible to add extra beds. The property also has a social area with dining room and living room that extend over a large suspended deck with swimming pool and solarium facing the sea. Meals are included in the lodging and prepared by our renowned chef, is not buffet. The beach is fully integrated property, "foot in the sand" and virtually exclusive. Aquela temporada de praia que sempre sonhamos, sem movimento, sem barulho, como se vc estivesse num sitio afastado, mas na beirinha da praia?? Isso mesmo!!! Aluguei 2 chalets, todos novos, excelente construçao, ótimos banheiros, ar condicionado split sem barulho, sossego total, espaço gourmet e sala super confortaveis, e aquela vista de matar!! O mar limpido, quente, só para vc, pois so vi 3 pessoas a temporada toda!!! Cozinheira excelente, cocos a vontade, conforto total, camas excepcionais, e o visual, ah, o visual!!! deitado na cama, no salao, indo para a praia, indescritivel. E passeiso faceis ao Rio Cahy, Ponta do Corumbau, com otimos restaurantes e uma pizza de enlouquecer paulista!! Voltarei varias vezes!!! Site entrance to the ocean's edge are 400 m in way through the coconut trees which is an optimal way to track you like and run not only on the beach.